Have you ever tried juggling? Two bean bags, call them Blogging and Taking Mom to Drs. Appointments,*** work. I try a third—Making a Wedding Quilt. Hey, that works too. Fourth bean bag, Finishing THE GRIZZLY’S CHRISTMAS, is trickier, but for a short time, it works. I also need to get Sending Out Queries for BIG ENOUGH, Bugging People to Finish Tasks, and Helping My Mom Go Through Stuff up in the air. Pick up Stuff. Blogging falls. Try to balance Finishing THE GRIZZLY’S CHRISTMAS on foot. Can’t possibly pick up BIG ENOUGH or Bugging Others while juggling the rest. Oh, I haven’t finished the Liebster assignments! ***My ninety-year old mom, who has an intense desire to go under the radar, has three doctors named Dr. Smith. Two of the Drs. Smith are twins who share an office, and two (not the twins) are Dr. J. Smith. Due to my mom’s aforementioned intense desire, I’ve made her younger than her true age and changed the doctors’ shared last name. Just to add one last detail about going to appointments, my mom lives several hours away from me—honest. This is a post of finishes. The wedding quilt for Lea and Matthew was completed in time for the beginning of their married life. THE GRIZZLY’S CHRISTMAS will be with the book designer by this weekend, and the new cover for the THE PIG AND THE DRAGON, which will be retitled SECRETS OF THE FLAME, arrived yesterday. The early spring garden and our sparse rainy season are ending. The energy of the volunteer plants is going to setting seed. Foliage and new flowers no longer concern the poppies. It’s the beginning of later blooms and our long, dry dormant season. The dying leaves of the naked ladies. Flowers won’t appear until late in summer when the plant will have no living leaves. And I’m finally doing the last two jobs for the Leibster Award. First, the award is passed on to other bloggers. I’m not going to name eleven blogs as instructed because I don’t follow eleven blogs. The small print on the Leibster Blog Award logo says to pass it on to three to five blogs. That’s more my speed. So here are some blogs you to investigate. See if you like them too. Oh, one thing. I don’t know how you tell how many followers a blog has so guess work is involved. Tricia Elisara kidsingardens.com is a master gardener who works in school gardens. She lists admirable goals for her blog which is devoted to gardens for and by kids. Tricia provides great ideas for linking different academic subject areas with the garden, takes wonderful photos, and provides inspiration for a rewarding endeavor that is sometimes hard to fit into the school schedule. There are two authors I’ve mentioned before who have blogs that are definitely follower-worthy. Laura McNeal http://postcardstothevoid.blogspot.com/2012/04/out-of-africa-and-into-ragnar.html I’ve read and reread her most recent post. She intersperses writing about a running event with the poem she memorized in high school “To An Athlete Dying Young.” Her writing is poignant, poetic, and humorous. I can think of no way to write something as touching with the poems I memorized in school—”The Owl and the Pussycat” and “The Spider and the Fly.” She is a person and author I want to get to know better. Since she hasn’t posted for awhile, I’m hoping if enough of us visit her blog, she’ll respond with new posts. Laurel Corona www.laurelcorona.com has recently returned to the blog on her website. The author of women’s historical fiction shares life events, her feelings, philosophy and spirit. There is a sort of flight to what she writes. She is another person and author I want to get to know better. Sophey Vance aka Sarai Oviedo at www.sopphay.omnipression.com is a poet, designer, literary editor, and more—a Renaissance woman who seems to take on a bit of everything. My friend Donna found her when we were trying to find more about the Liebster Award. Sophey has received it three times. That pushed her into researching the origins of the Liebster. She stopped researching before answering all her questions. Part of my motive in nominating her again is she said if she got the award five times, she would consider more research to answer those remaining questions. Just consider this a gentle nudge rather than a bribe. 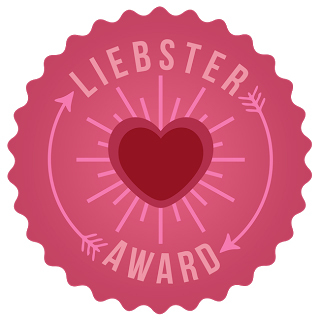 The last task for the Liebster is to paste the award in the blog. One more thing finished! Thank you, Dan, it was fun. You were also right that it’s a lot of work. These finales mean there’s time to pick up some of those fumbled tasks, to return to THE PIG AND THE DRAGON sequel, and to begin a new quilt. Exuberant epiphytes begin their bloom period this week. This is the first time this iris has bloomed! “They’ll laugh—they’ll cry! Maybe they’ll make it into a movie!” I wouldn’t say these words aloud, but that’s what I’m thinking when I first write something. My self-assessment helplessly bounces between these extremes. And then, from the sanctuary of a gathering of fellow writers, comes aid. Why do I need them? Calla lily with a new resident spider. 1) These sisters and brothers consider my words with objective eyes and ears. They help me know when something is ready to send out and when I must do yet another revision. Because they give both positive and critical feedback, they keep me from throwing out the sandwich with the waxed paper. 2) Over time, the members of my groups have taught me how to be a better writer. Some members are especially adept at seeing the overall structure of a piece and how the plot or a character might be constructed. Others help find a word that truly fits in a sentence or catch grammatical errors. Their notes on this post from the last meeting. Sometimes an individual’s voice becomes so familiar, I can hear what he or she would say before taking a piece to group. They have taught me to stop when I “feel the snags” in my writing, and, if I don’t know what to do about a problem, they help. A big bud on the hummingbird sage—a beginning. I’ve finally learned to JUST LISTEN. There is no point in explaining what a passage is supposed to convey unless I’m asking for suggestions about how improve my writing. And when I tell myself, “At the very least, you haven’t completely communicated what you meant,” that thought keeps me from becoming defensive. Sometimes I realize I’m not clear to myself. Everyone person I’ve met in critique groups becomes a stronger writer if he or she listens and perseveres. 3) A meeting date gives me a deadline. I’m the kind of person that stays on track when a time limit is hanging over my head. 4) In a critique group, each writer is also an editor for others. It’s a great learning opportunity without the emotional entanglement of hearing your baby is not going to be the December centerfold in Parents magazine. Just remember that what you are evaluating and editing ISN”T your baby. If you are the writer, you determine which criticism to take to heart and what to ignore. Not all critique groups are the same which doesn’t necessarily mean good or bad. You just need to find your right match. You may need to “date” before you find Group Right. Ideally, a group is at the same general skill level. I think it helps to have similar motivations also. I like small groups with about four to six members. You get several viewpoints and the group is small enough to really spend time on each piece. So find a group of other writers whose opinions and writing you respect. You may also need to locate a group who specializes in writing for certain ages or in a specific genre. 5) A critique group fulfills the need for communication, the ultimate goal of writing, and the need for company since writing has its lonely aspect. Hmmm? People who support and encourage us while still helping us grow, people who celebrate our successes and soften rejections, people who listen to and respect each member, people who help us figure out what we mean—sounds like a definition of friends to me. I finished the wedding quilt, but can’t show the front until after the wedding. And I have enough of the backing fabric to make some else. P.S. One of my critique groups reviewed this post twice and “encouraged” me to revise it another time. So here’s it’s third version. P.P.S. Did you notice it’s Thursday? See you next week!